Ever see a fish climb a waterfall? In Hawaii, it’s the course of business for most native freshwater fishes. I know when I think of fish habitat in Hawaii, I visualize snorkeling in crystal clear water over coral reefs teeming with marine life. What often gets less attention are the freshwater systems. At first glance, freshwater streams in Hawaii don’t look like amazing fish habitat. 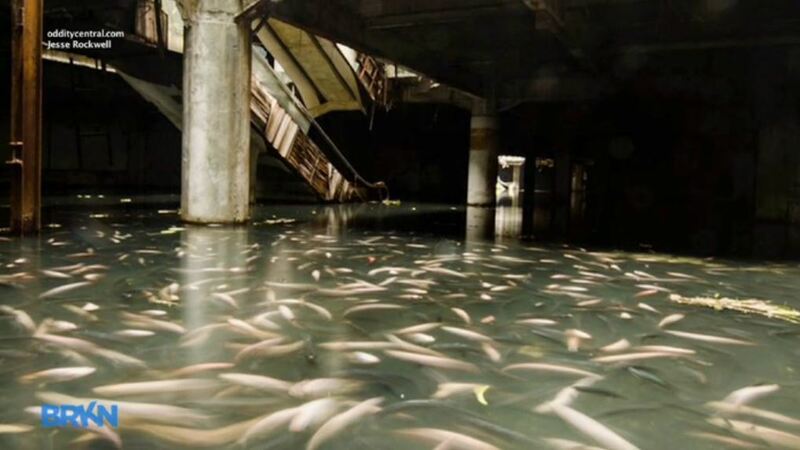 They’re generally not very large once you move upstream from the mouth of the watercourse, they’re “flashy”, meaning that water levels can fluctuate very quickly, and in many areas, the topography is steep, making fish passage seem impossible[i],[ii]. Despite this, some fish display extreme adaptations that help them call Hawaii’s freshwater streams home. Left photo: A typical Hawaiian stream. Photo by T. Sim from the University of Hawaii at Mãnoa (http://www.pbrc.hawaii.edu/~taras/location.html). Right photo: An example of the mouth of a Hawaiian stream, just upstream of where the watercourse empties into the ocean. Photo by A. McLean. There are only five native freshwater fish species found in Hawaii, referred to as O’opu by locals on the islands[iii]. Four of these species are part of the goby family, and one fits into the family known as sleeper goby[iv]. The difference between goby and sleeper goby is that goby have fused pelvic fins that create a suction disc that allows them to suction onto hard surfaces. The pelvic fins of sleeper goby are not fused and do not create a suction disc. This difference plays a key role in where you might find these fish within a Hawaiian streamii. The five freshwater fishes native to Hawaii are Stenogobius hawaiiensis, Eleotris sandwicensis, Awaous guamensia, Sicyopterus stimpsoni, and Lentipes concolor. They can be found in ascending elevations in Hawaii’s freshwater streams. Image from Evenhuis, N.L. and Fitzsimmons, J.M. 2007. Biology of Hawaiian streams and estuaries. Bishop Museum Bulletin in Cultural and Environmental Studies. Where you’ll find each of these five species depends heavily on the elevation of the stream[v]. Lentipes concolor, known as O’opu Alamo’o locally, can be found at the highest elevations, which includes above 100 m high waterfallsi. You might be thinking maybe they’ve always been there, or perhaps someone has transported them above these obstacles to fish passage. These thoughts seem plausible, until you learn that all five of Hawaii’s native freshwater fishes are amphidromous and that their lifespans are thought to be relatively short. Amphidromy describes a specialized life cycle where adults spawn in freshwater, their eggs hatch and the larvae are swept downstream to the ocean by the flowing water. The larvae then feed and grow in the ocean for several months before returning to freshwater, developing into adults, and reproducing[vi]. So how do these fish get upstream of waterfalls? They climb using their suction disc and ‘power bursts’, allowing them to climb approximately 12 body lengths per second for a short duration[vii]. Sicyopterus stimpsoni (known as O’opu Nopili), usually found at lower elevations than L. concolor, is still usually found above the remaining three species. These fish employ a slightly different climbing style, using their suction disc and their mouths to ‘inch up’ vertical rock wallsvii. 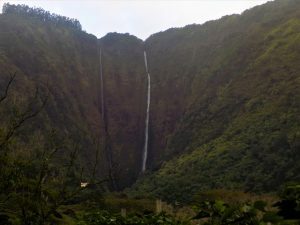 An example of a steep Hawaiian waterfall. Photo from Waipi’o Valley on the island of Hawaii. Photo by A. McLean. The two species that you’ll most likely find near stream mouths are Stenogobius hawaiiensis (O’opu Naniha), and Eleotris sandwicensis (O’opu Akupa). S. hawaiiensis is not well studied, and little is known about their ecology and evolutionii. E. sandwicensis is a species of sleeper goby; the lack of fused pelvic fins to create a suction disc discourages climbing. Finally, Awaous guamensia (O’opu Nakea), the only one of the five native freshwater fish species in Hawaii that can be found elsewhere, is more common at elevations below L. concolor and S. stimpsoni, but above S. hawaiiensis and E. sandwicensis. Next time you’re in Hawaii, or another tropical island with sublime marine snorkeling, give some thought to the freshwater systems, and some of the extreme adaptations fish might need to make their homes there. [i] Kinzie, R.A. III. 1988. Habitat utilization by Hawaiian stream fishes with reference to community structure in oceanic island streams. Environmental Biology of Fishes 22: 179-192. [ii] Brasher, A.M.D. 2003. Impacts of human disturbances on biotic communities in Hawaiian streams. Bioscience 53: 1052-1060. [iii] Zink, R.M., Fitzsimons, J.M., Dittmann, D.L., Reynolds, D.R., and Nishimoto, R.T. 1996. Evolutionary genetics of Hawaiian freshwater fishes. Copeia 2: 330-335. [iv] McDowall, R.M. 2004. Ancestry and amphidromy in island freshwater fish fauna. Fish and Fisheries 5: 75-85. [v] Evenhuis, N.L. and Fitzsimmons, J.M. 2007. Biology of Hawaiian streams and estuaries. Bishop Museum Bulletin in Cultural and Environmental Studies. [vi] McDowall, R.M. 2007. On amphidromy, a distinct form of diadromy in aquatic organisms. Fish and Fisheries 8: 1-13. [vii] Schoenfus, H.L., and Blob, R.W. 2003. Kinematics of waterfall climbing in Hawaiian freshwater fishes (Gobiidae): vertical propulsion at the aquatic-terrestrial interface. Journal of Zoology 261: 191-205.